Between Lienz and Spittal on the Drau, in the Carinthian Upper Drautal Valley, a holiday house stands above the valley, from whose flowered balconies you can have heavenly views over the Drautal Valley and the Gailtal Valley Limestone Alps. The house peeks at the passing traveler out of a wide clearing in the forest, and seems to draw him in, inviting him to stay a while. 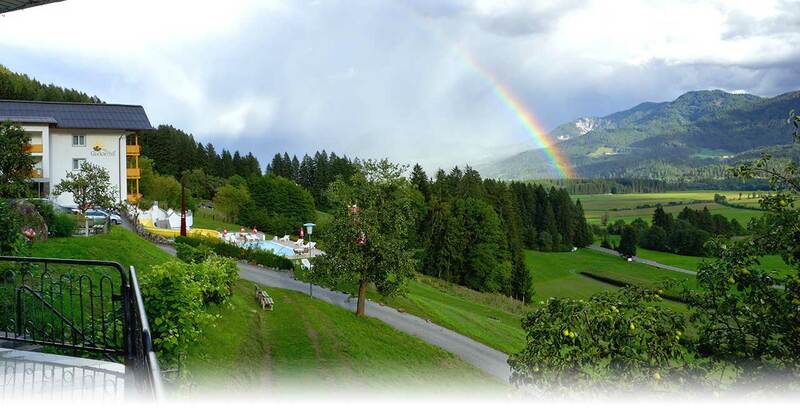 Up here, a little ways up the mountain, but not entirely secluded, a small piece of farmland became a large part of Carinthian hospitality, the first and leading holiday home in a region that, with all its allure and beauty, is a real piece of Carinthia. Its not hard to describe all these things: For children and sporting fans, it’s an area for romping around, for the young at heart a place for meetings, a lively place for all, a world that is varied and open. The Glocknerhof is a self-sustaining establishment, biological if you want, an ideal living space, a place for healthy relaxation, a place for the senses. Yes, this is a big part of the secret of its success. The business was once built on the sale of special delicacies such as fruits, schnapps, smoked hams and bacons and homemade bread, and so could unfurl itself through its own strength. There are many beautiful and romantic places in the world, but there’s only one Glocknerhof. Many lucky factors have combined to give you a unified whole. The heavenly location, the customary **** comfort, the coziness, the proverbial “good kitchen,” the skilful hands of the hotelier’s family and the farming traditions: All this contributes to the fact that you can feel well in the house and its surrounding areas.